A World of Words: Percy Jackson and the Lightning Thief - methadone?! Percy Jackson and the Lightning Thief - methadone?! The first bestselling book in Rick Riordan's phenomenally successful Percy Jackson series. Look, I didn't want to be a half-blood. I never asked to be the son of a Greek god. I was just a normal kid, going to school, playing basketball, skateboarding. The usual. Until I accidentally vaporised my maths teacher. That's when things started really going wrong. Now I spend my time fighting with swords, battling monsters with my friends, and generally trying to stay alive. Can Percy find the lightning bolt before a fully fledged war of the gods erupts? This one has been on my 'to-read' list for a couple of years now, since the film came out and I saw how much enthusiasm my teenage American cousins showed for the books. I must say, I enjoyed it and I'll be reading further in the series. It's probably for the best that Percy finds out about everything at the same time as the reader - I only know the basics of Greek mythology, and it kept me reading to find out why Percy (or Perseus, to use his full name) was coming so much under attack. I should probably mention that when I'm reading books on my Kindle, I have usually downloaded a lot of books at once, and then don't bother re-reading the blurb before I start the book. It's well paced, with a lot of action making it a book I got through quickly, although I also think it would have worked well slowed down a little. I must say, I was struggling a little to talk about this book. While it is good, I think the characterisation could be worked on just a weeny bit more. Throughout, Percy refers to people as either friends or bullies, and, whilst he is immersed in camp and the reader is 'just' reading, I don't think I was told quite enough about characters like Clarisse and Luke for them to have much of an impact in terms of how I should feel about them for Percy's sake. Then, though I really liked that nothing romantic was introduced between 12 year-olds Percy and Annabeth, and I also liked her feistiness, I wasn't all the way there in rooting for Annabeth either. I could even have hated Smelly Gabe (Percy's detested stepfather) more. This may just be me, or possibly because I've just read The Hunger Games, which I find has so far beaten off competitors fairly well! Saying that though, I reckon this will get a lot better in the following Percy Jackson books. I thought it was a great idea to use Greek mythology, and it was a great part of the plot to see gods using the trio as pawns to get their own way and/or create havoc. I loved the sub-plot about Medusa, and often wondered how Percy was going to get out of certain situations. 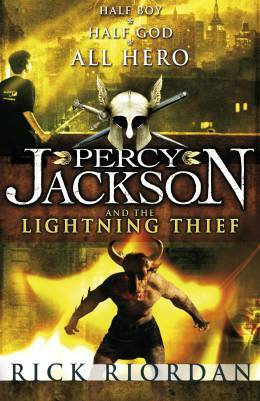 I've just read a great review on goodreads that links the similarities of The Lightning Thief to Harry Potter, particularly the first book. They are definitely big similarities, and as the review author puts it, The Lightning Thief is like methadone when trying to come off Harry Potter. I thought that was an awesome way to put it, and probably accurate - Percy Jackson is a watered down version of Harry Potter! What do you think? this blog is very useful for us.because we learn many things from this blog.